PLANET in PERIL, your "one-stop shop" for the truth about our planetary crisis. : Even our national bird - the Canada jay - is not immune from the ravages of manmade climate change. Even our national bird - the Canada jay - is not immune from the ravages of manmade climate change. Decades of Canadian research, just released, finds "strong evidence" that increasing "freeze-thaw" cycles are destroying food the birds store away in the fall. This, in turn is damaging their ability to reproduce and likely playing a role in a severe population decline in at least one region. 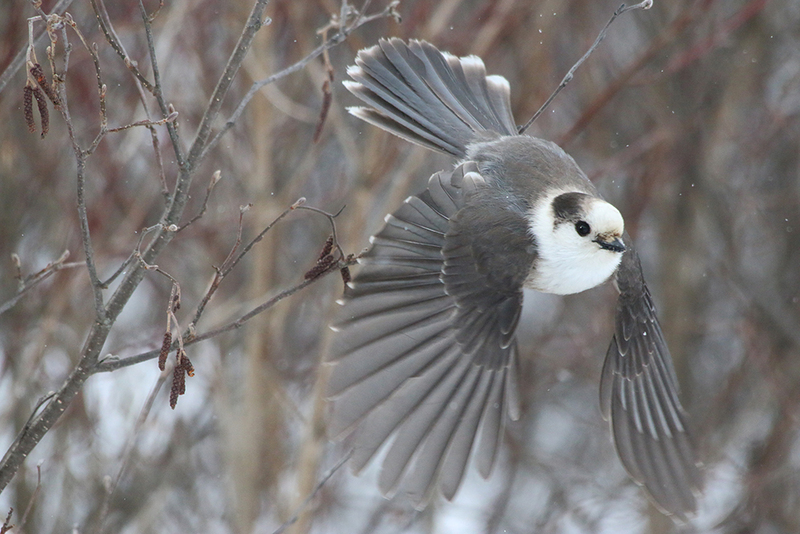 A Canada jay - aka - "Gray jay" or "Whiskey-Jack." Photo by Steve Phillips, via Canadian Geographic magazine. It's been known for some time that our changing climate is leading to reductions, even entire removal of many species from certain areas (a process called "extirpation"). This new research by the University of Guelph, sheds more light on just how that happens. Like many species, they hide or "cache" significant amounts of food away which they'll need later on when it is more scarce - mainly the breeding season late in the following winter. In past years, when winters were more consistently cold, this would allow them to retrieve it, intact. But with "freeze-thaw" cycles becoming more frequent, that food is either rotting or greatly degrading in nutrient value. As a result, the jays are having fewer young and those young are less healthy than before. The spokesperson for the study, Alex Sutton (l.), tells PinP, "The population in Algonquin has declined by over 50% since the 1980s. So we do believe that climate change is currently affecting this population. While work is ongoing about the actual cause of the decline, it is likely that changes to reproductive performance do contribute to the decline." The birds eat a variety of things, some which you might expect, like insects, berries and mushrooms, and some you might not - like nestling birds they catch themselves and game meat that has been shot or trapped by humans. (It's the meat, berries and fungi which are most vulnerable to spoilage.) The birds often hide it away in tree forks, behind flakes of bark or in conifer needles. It is this instinctive practise that seems to be coming back to haunt them now. To quote the study, "Our results suggest that freeze-thaw events have a significant detrimental impact on the quality and/or quantity of cached food available to Canada jays. 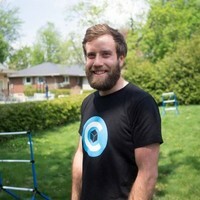 Future increases in such events, caused by climate change, could pose a serious threat to Canada jays and other food-caching species that store perishable foods for long periods of time." 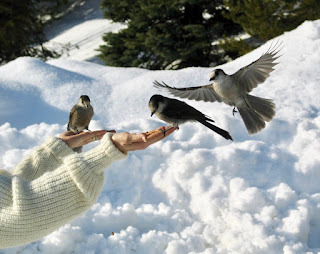 A woman feeds jays in Manning Park, B.C. Anyone who has visited or camped in our boreal forests has likely seen them. They don't shy away from begging food from people, or stealing it from your picnic table when you're not watching! They've become an iconic and well-loved symbol in our country. The research findings have just been published in the proceedings of The Royal Society in the UK.